Every item purchased in our shops helps us to provide care for local people and their families living with a potentially incurable illness. 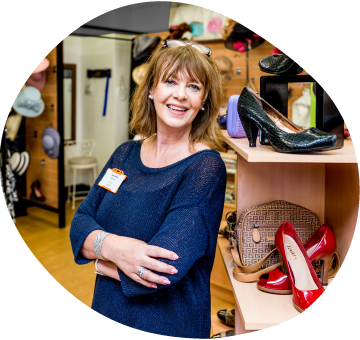 We have a network of 30 charity shops located across our catchment area, as well as our eBay shop. Please be aware of changes to our shop opening times over the Easter period. Good Friday 19 April – All shops open normal hours. Saturday 20 April – All shops open normal hours. Sunday 21 April – All shops closed. Bank Holiday Monday 22 April – All shops closed except Mere Green Superstore (11.30am-3.30pm). Tuesday 23 April – All shops open normal hours. Shenstone Distribution Centre is closed over the Easter break, from Good Friday re-opening on Tuesday 23 April. We sell quality, second-hand items including clothing and accessories, gifts, household items, books, CDs, DVDs and toys plus and a selection of new goods, including greetings cards and wrapping paper. We also have a range of different specialist shops selling furniture, bridal wear, accessories and books. We offer our lottery players 10% off in all our shops, just by showing your Promise Card. Please note: Thanks to generous donations from our local community, from time to time our shops and distribution centre can struggle for space to store donated goods. Before making a special journey to drop off donations, please call ahead to check that your local shop or the distribution centre have space for more goods. Your support matters. Thank you.